There is no greater prize in the world of hot rodding than “America’s Most Beautiful Roadster”, conferred annually at the celebrated Grand National Roadster Show in California to the car that best exemplifies the contemporary art of the roadster. 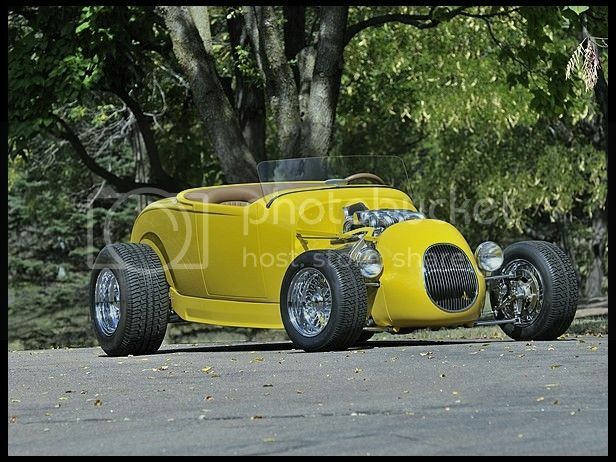 The late Joe MacPherson of “Joe’s Garage” fame was an admirer of all things automotive, but he felt a particular appreciation for the AMBR’s first winner in 1950, Bill Niekamp’s 1929 Ford roadster. A tribute to Niekamp’s artistry, the car’s strongest feature was its unique track nose borrowed from the early postwar Midget racers of which MacPherson was a great fan. Indeed, Niekamp’s prize-winning beauty held such lasting allure for MacPherson that, in 1991, he assembled a formidable roster of talent whose task was to build a Niekamp-inspired roadster designed to win the same coveted AMBR award. MacPherson engaged famed California rodders and constructors Art and Mike Chrisman, both renowned for their craftsmanship. Art, along with his brother Lloyd, made his reputation as a builder and racer with cars like the famous Bonneville Coupe, which was a central component of MacPherson’s prized collection. MacPherson then added eminent body men Steve Davis and “Squeak” White, Junior Conway to apply the brilliant finish and none other than Tony Nancy to upholster the car’s tasteful and luxurious interior and its matching form-fitting luggage. The Chrismans began the project by fabricating a chassis that would stand on its own as a premier example of the metal crafter’s art. Representing an investment of almost 400 hours, the frame closely replicates a set of 1932 Ford rails but was specifically equipped to mount the car’s contemporary drivetrain, which feature leads to the story of its thoroughly modern powerplant. A successful car dealer, MacPherson’s original intent was to fit the car with a four-cam ZR1 Corvette engine from Chevrolet, who turned down his request. His Infiniti representative then stepped up with the drivetrain from a written-off 1992 Q45 sedan, and so Joe resolved to build the first Japanese-powered AMBR-winning rod. The Chrismans took over from there, lending their inimitable talents to preparing the V8 for its new life in Joe MacPherson’s pioneering rod. Almost every surface was chromed save for the cam covers, which were finished in gleaming Champagne Metallic paint. The intake system alone is a head-turning object d’art, its chromed and contoured plenum and runners providing a uniquely organic element. Rod Sexton fabricated a polished stainless steel exhaust system that matches the engine’s brilliant finish. Another unique element is the cooling system, brilliantly conceived by All American Racers legend Phil Remington. To keep the rounded track-style nose as small as possible yet maintain functional cooling, the radiator was moved to the rear of the car and is cooled by thermostatically-controlled fans drawing air in from the underside between the trunk and the cockpit. Mike Chrisman mounted the Infiniti center section directly to the frame to reduce unsprung weight and installed a fully-chromed custom built independent rear suspension. The elegantly executed front double A-arm suspension incorporates Bilstein shocks with Deuce Factory springs. Chromed hand-assembled Borrani wire wheels are mounted over custom brake rotors turning within chromed Corvette calipers. Here as elsewhere, both concept and execution are spectacular. Such was the builders’ attention to the tiniest detail that every bolt on the car is of a matching set; all the heads were machined flat, hollow ground, chromed, then the recessed top surfaces were etched to produce a satin finish. Steve Davis and Squeak White collaborated on forming the gorgeous steel and alloy body, which is so masterfully crafted that it uses no filler whatsoever. It is a masterpiece executed to the finest tolerances; the handcrafted aluminum hood clears the engine by a mere 5/16 of an inch, and all seams are laser-tight. The car received countless hours of priming and blocking at Junior’s House of Color to produce a perfect foundation for the ten gallons of Ferrari-style yellow lacquer applied by Junior. Upholstery artisan Tony Nancy stitched the interior using buttery-soft tan Rolls-Royce Connolly leather to cover the Ferrari-inspired buckets built by Steve Davis. The steering wheel, pedals, door panels, dash, shifter boot and knob and trunk lid liner are similarly finished, as is the handsome formed luggage that fits perfectly inside the trunk. Italian Wilton velvet wool carpeting is of the same rarified quality. Another elegant detail: the custom-built gauges, with off-white faces color-keyed to the tan upholstery, feature early-Stewart-Warner style convex glass and MacPherson’s name along with the Infiniti logo. While Tom Mayfield and Bill Larzelere prepared and detailed the Q29 Infiniti Flyer the night before the 1994 Oakland Roadster Show, its completion was celebrated at a party hosted by MacPherson for his talented team and their families. The next day, the car rocked the hot rodding world by winning every award at the Show, with prizes for best paint, interior, engineering and the one most coveted by MacPherson, “America’s Most Beautiful Roadster”. It followed that sweep with a “Best Appearing” award at the Detroit Motorama. Hot Rod magazine’s very own Gray Baskerville once said that it was impossible for his or any other periodical to adequately present Joe MacPherson’s masterpiece, and Baskerville was almost never wrong about such matters. It has been fifteen years since the Q29 Infiniti Flyer was named “America’s Most Beautiful Roadster”, and such is the artistry evident in every facet of this jewel that it presents as beautifully today as it did the day it claimed that prize, testament to its stature as an enduring classic of American rodding.